What Is Divine Providence? Is It Biblical? Several years ago I spent over four years as part of my doctoral dissertation researching the writings of America’s founders to see what they believed about the Bible’s role in a free society and our republic. What I found was quite astonishing. I found that their writings and letters were full of Scripture that was part of their everyday conversation. 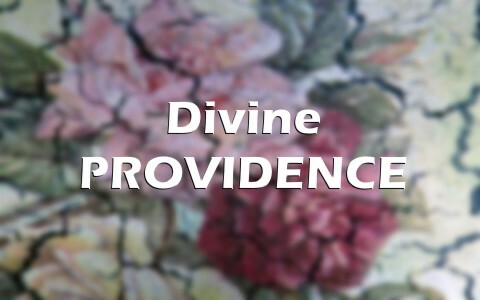 I also saw that the phrase, providence or divine Providence, was used quite often. Further study revealed that this phrase was not something that they invented, it was something they inherited from their ancestors. This led me to research what is divine providence and is it Biblical? What is the common definition of divine providence? Traditional theism holds that God is the creator of heaven and earth, and that all that occurs in the universe takes place under Divine Providence — that is, under God’s sovereign guidance and control. According to believers, God governs creation as a loving father, working all things for good. Moreover, it is said, God is an absolutely perfect being. He is, first of all, omniscient or all-knowing: he knows of all truths that they are true, and of all falsehoods that they are false, whether they pertain to past, present, or future. And God’s knowledge does not change. Nothing is learned or forgotten with him; what he knows, he knows from eternity and infallibly. Second, God is omnipotent or all-powerful: anything that is logically possible, he can do. Finally, God is perfectly good: in all circumstances he acts for the best, intending the best possible outcome. This common definition of divine providence not only encompasses the attributes of God, but also His sovereignty over His creation. This definition in reference to God was common knowledge to America’s founders. They demonstrated this by using the term “Providence” in the final sentence of the Declaration of Independence in reference to God (2). What does the Bible say about divine providence? The Bible only uses the word providence once in Acts 24:2. This verse was part of a passage of Scripture that told of the High Priest accusing Paul of causing trouble. At one point, Paul was called before the governor where his accusers addressed the governor with an overflowing amount of respect, telling him how they benefited from the wonderful deeds that he had done to the nation by his providence. Their use of the word providence, demonstrated that they looked to man as their provider and protector. When you look at the Greek word for providence (pronoia) in the Bible, it is also translated as provision in Romans 13:14. This passage uses it as part of an admonition not to make provision for lustful desires of the flesh because there is much work to be done for the Lord. In both New Testament uses of this word, it makes a definite reference to providing for something for others. You find the same concept when you look at the Hebrew word for provision that is also translated into words that refer to meat or food. What is the history of the word providence? The word providence has a long history that goes back many centuries to Augustine of Hippo and Thomas Aquinas. It also was adopted as a foundational belief of Catholic, Reformed, and Lutheran theology. Reformed theology, brought into Protestant mainstream by John Calvin, was a common belief of the early American settlers from Europe. For this reason, the capitalized version of the word, Providence, was commonly used to refer to God as their protector and provider. In American History, it was used by English Clergyman Roger Williams in 1636 when he had fled the Massachusetts Bay Colony to escape religious persecution. He settled in an area that he named Providence Plantations, which is known today as Providence, Rhode Island. There, he also founded the first Baptist church in America. His theological perspective on leaving the safety of the Massachusetts Bay Colony and trusting God for divine provision and protection was his motivation for naming the colony Providence plantation. The name Providence plantations continues to be part of the official state name of Rhode Island to this day. The simple answer is, and I stress the word simple, it depends on who you ask and how they define it. For those of the strong or hyper-Calvinist/ Reformed Theology persuasion, the answer would be yes as they hold a strong belief that God’s sovereignty even decides who will become a believer and who will choose to reject Christ. For those of the strong or hyper-Armenian/Methodist theology, the answer would be no as they hold a strong belief that man’s choice can change God’s will. The Bible promotes a view that is between both perspectives. While God is sovereign, He does allow man to have some freedom to make choices, often to man’s own demise (Deuteronomy 30:15-20; Joshua 24:15; Psalms 25:12; Proverbs 3:31; Matthew 13:1-5; Philippians 1:21-23). To believe otherwise, would suggest that God is responsible for man’s sinful choices and rejection of Salvation (Matthew 18:14; 2 Thessalonian 2:9-12; James 1:13-15; 2 Peter 3:9). On the other hand, God has a plan for humanity, yet to believe that man has the power to overrule God would suggest that God is not in sovereign control (Isaiah 46:10; John 10:27-29; Romans 8:23-30; Colossians 1:9-23; 1 Corinthians 8:6; Ephesians 1:9-12). In either case, God can allow us to make choices and still accomplish His will because of His power, knowledge, and wisdom. He knows every hair on our head, every bird that falls from the sky, and every thought and intent of our heart (1 Samuel 16:7-8; Matthew 10:29-31; Luke 12:4-7; Hebrews 4:12). If we make a bad decision, God even has the ability to make good out of it (Genesis 50:15-21; Romans 9:13-24; Hebrews 11:20). God’s power, wisdom, knowledge, and love is unsurpassed. This gives Him the ability to be our source of Divine Providence. He provides for us as a heavenly Father because He loves us (Genesis 22:8-13; Matthew 6:25-33). He provided a way of Salvation through Christ, who enables us to love Him and our neighbor (Matthew 7:7-11; Luke 11:5-12; Hebrews 11:32-40; 1 John 4:19). In consideration of all of these things, divine providence is Biblical, as long as we use the Bible to define it and recognize God as the embodiment of the same. Divine providence not only encompasses the attributes of God, but also His sovereignty over His creation. Historically, it has been defined different ways, depending on one’s theological perspective. However, the Bible teaches us that God has the power to control every aspect of the universe, while at the same time, He gives us the freedom to make choices that are ultimately subject to His divine plan. God is our source of Divine Providence. Related reading: Should Christians Pray if God is Sovereign? Well done, Dr Williams. It is somewhat similar to trying to explain the Trinity, right? How can God be sovereign while allowing us to choose? Tough stuff until you realize, as you said, that God is sooo far above our understanding that He ultimately allows our decisions to accomplish His ultimate Will. Have you ever wondered why Jesus taught us to pray, “Your Will be done” when we know it will whether we pray or not? He uses us imperfect earthen vessels, in this incredible symbiotic relationship, to somehow accomplish His purposes. It is a mystery. Is Psalm 33:15 and Jeremiah 17:10 included in this article? Hello Mr. Haney. Psalm 33:15 and Jer 17:10 are more about God knowing the heart than they are about God sovereignty or providence. Thank you for your comment. I too enjoyed your article, Dr.
Wow that was a tuffy to write I can imagine. Fine research and logically presented. We use the word “sovereign” to refer to kings for instance. There is an earthy providence apparently when we put our trust in man and not God. I do not pretend to understand God. Did you find any of the founding fathers to be deists? What did you determine about the beliefs of Thomas Jefferson who took 2 Bibles and after alteration kept what he liked and cut out the rest? Any believers in true Divine Providence in the purest of Biblical sense? Have you considered calling the Founding Fathers to be Fathers to us? The Bible states we have but one Father who is in Heaven. Personally I think we should drop the Fathers and just keep founders. I figure we are like the tiniest of ants in comparison to his omnipotence and His attributes. Come to think of it we probably are even lesser than ants. At least ants follow directions. Ever seen them go in a line to and from work? Thank you for your years of work and service to the Lord. Hi Pat G, Dr. Mike is going to love your questions. You are touching on his second most favorite topic — American History, second only to the Bible. Great questions, I look forward to the answers! I hope he answers them too. And of course the g-god [government god]. Look for the joy in Jesus alone. If anyone can answer the questions it surely is Dr. Mike 🙂 I respect his years of work both Biblically and Historically. Jefferson chopped up especially the Book of John that expressed and proved the Divine Jesus, God the Son. Jefferson and the other deists thought Jesus was just some guy that had some untested moral ideas. The Creator, three-in-One did not just drop us on the planet and walk away. Biblical Christians are glory bound through Our Savior Jesus Christ alone. Our true home is a far country called Heaven. We are in this world not of this world. Even yet, Come Jesus Come! Your article was interesting & insightful Dr.Williams. I do have one thing to point out and it’s at the beginning where you say” Second, God is omnipotent or all-powerful: anything that is logically possible, he can do”, this is where I had to stop and say “wait a minute”! GOD doesn’t need LOGIC….it doesn’t have to be logically possible…to man yes. But GOD works the impossible….he can do the illogical….his range supercedes any thought or idea that we COULD EVER HAVE! I just had to point that out. Thanks! This is a good and well written article, thanks for posting. our article was interesting & insightful Dr.Williams. I do have one thing to point out and it’s at the beginning where you say” Second, God is omnipotent or all-powerful: anything that is logically possible, he can do”, this is where I had to stop and say “wait a minute”! GOD doesn’t need LOGIC….it doesn’t have to be logically possible…to man yes. But GOD works the impossible….he can do the illogical….his range supercedes any thought or idea that we COULD EVER HAVE! I just had to point that out. Thanks! Read more:in research and philosophy by others. By accepting that god does things our side of normal science or logic seems to put logic outside the grasp of man. Of course we can say that he is eternality and not in time, therefore it is logical that he does not put his foot into time because it would swallow up all of time and space. god is possible the only person that is outside of time as an personal creator of this loving whole universe. Why should he then abide by the logic, scientific and revolving changing universe but to allow laws and principles of laws intermingled with truth to prevail. Just a thought, stop making out god to be a magical being, transcendent of our concepts of defining reality. we are in the shadow of reality, and he God is the reality. WE face a uphill battle to perfect our nature given to us by his all powerful creative design, when we come to manage it well it seems for the most part we can hear him speak wise and faithful servant. Thank you Winston, but I read the article and I don’t think Dr. Williams is saying God is a “magical being.” Why would God work outside of logic. His very name is the Word, “Logos” and is all truth. Jesus is the Truth (John 14:6) and His truth is always logical and without error. Why would God do anything illogical anyway, so since I have known Dr. Williams for a few years now, and he is as theologically solid as they come, I think your comments to him are a bit unfair. Thanks for your comment.